CALGARY, ALBERTA--(Marketwire - June 12, 2009) - What began in 1975 as a small home-based business in Calgary, has grown into a family business success story. On June 11, 2009 Swimco was honored as the 2008 recipient of The Calgary Award: Community Achievement in Commerce. Calgary-based Swimco started in the basement of a family home providing swimwear in a market where there was limited availability. Today, Swimco is owned and operated by Lori Bacon, her brother Steve Forseth and Lori's husband, Dave Bacon. The same strong family values that guided the company in 1975 continue to steer it today. The goal remains the same: to fit customers with great swimsuits, shorts, sandals and more so they can make the most of their vacations. The Calgary Awards were created in 1994 by The City of Calgary to celebrate and recognize outstanding achievements and contributions made by Calgarians. There are a total of 17 awards and the Commerce Award is given to a Calgary business for making significant community or industry contributions, improving business opportunities and/or bringing recognition to Calgary. Swimco's recognition stems from multiple areas. As an employer of many young Calgarians, one main objective is to ensure employees gain positive experiences and skills as members of the "Swimco Family". Another focus has been helping the "Swimco Community of Customers" by providing women with honest swimwear advice and instilling them with self-confidence. These contributions have been possible through the strong business management model that has proven decades of growth, adding financial and community value to the Calgary area. Lori Bacon, Swimco's President, proudly said, "We feel honored to have won this award. Calgary is thought to be an unlikely, if not impossible, place to headquarter a swimwear retail chain. However, the work ethic and entrepreneurial spirit of Calgarians overcomes any shortfalls in weather! It's the incredible team of Swimco employees who have taken such extraordinary care of our customers over the years which has allowed Swimco to grow into the company it is today." Swimco is proud to be Western Canada's leading swimwear retailer, with 13 stores and nearly 150 employees. For more information or to schedule an interview, contact Lori Bacon at 403-259-6113 ext 234, lbacon@swimco.com OR Lisa Wise at 403-607-3067, email lwise@swimco.com. www.swimco.com. More information about 2008 The Calgary Awards can be obtained by contacting The City of Calgary at 403-268-8881, calgaryawards@calgary.ca. 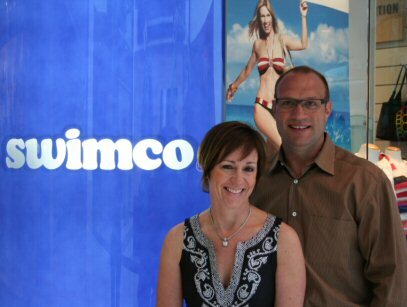 To view an image of Lori and Dave Bacon of Swimco, please visit the following link: http://media3.marketwire.com/docs/611swimco.jpg.